Pentax eyepieces are a near consensus choice amongst serious amateur and professional astronomers as the best that's out there, quite an accomplishment indeed given the fervent passion of the collective. The XF lineup are less costly options which were designed for the PF-65ED and PF-65EDA midsized class of spotting scopes and their somewhat shorter focal length of 390mm. They can be used with any Pentax spotting scope, as well as with other telescopes which accept the standardized 1.25 eyepieces. The XF eyepieces are meet the J.I.S. "Class 4" standard for waterproofing, described by the Japanese regulators as water splashed against the enclosure from any direction shall have no harmful effects". 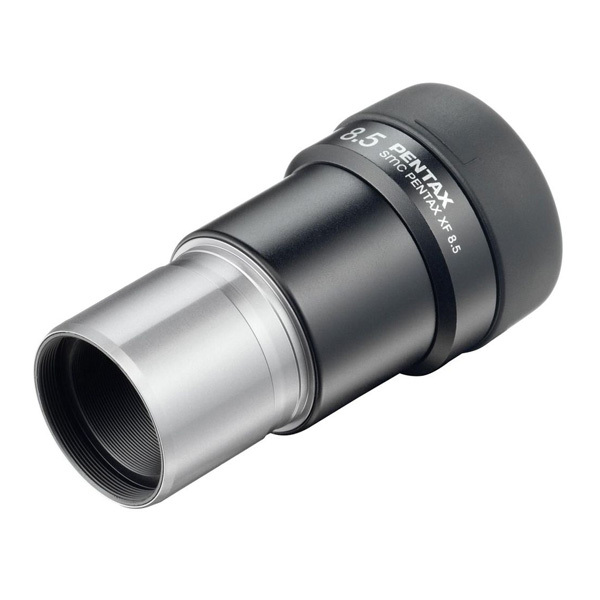 Pentax premium spotting scopes adhere to the American standard of 1.25 eyepiece thread diameter, facilitating the use of eyepieces from independent manufacturers. That also means, of course, that the wonderful Pentax eyepieces can be used in other telescopes and spotting scopes which accept 1.25 eyepieces.